Disclaimer: This is a cooking post not an art post! But I will say that there is an art to boning, stuffing and baking this recipe--and it comes out looking like a work of art too! 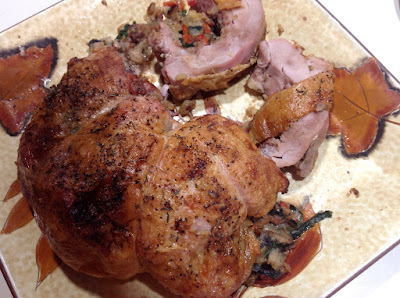 If you like dark meat turkey this is the recipe for you---but not an every day recipe for sure! They sell 2 packaged together and frozen so be sure to pull them out and let them thaw a couple days in the frig. It takes time to bone out the bird, make the stuffing, and tie it all up---although I bone the turkey and make the stuffing ahead. I don’t know quantities for everything---I just wing it! 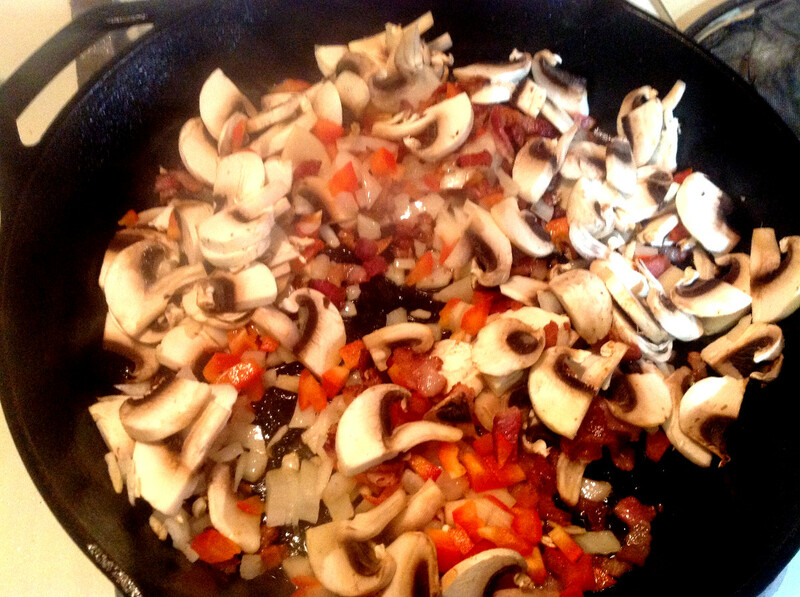 Probably used ½ onion, ½ red pepper, lots of mushrooms. Depends on what you and your family like. Mushrooms tend to cook down quite a bit and we like them so I use a lot. Add or change out the ingredients as you like! Cook the bacon and remove from pan and discard all but a tablespoon or two of the fat. 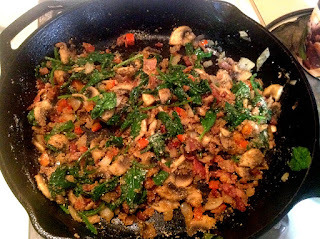 Saute the mushrooms, onions, red pepper in the remaining bacon fat and when almost tender add the spinach to wilt. Turn off heat. Stir in parmesan, breadcrumbs and enough stock to help it bind. I like it fairly dry as the turkey will give off some moisture and you don’t want the stuffing too mushy. 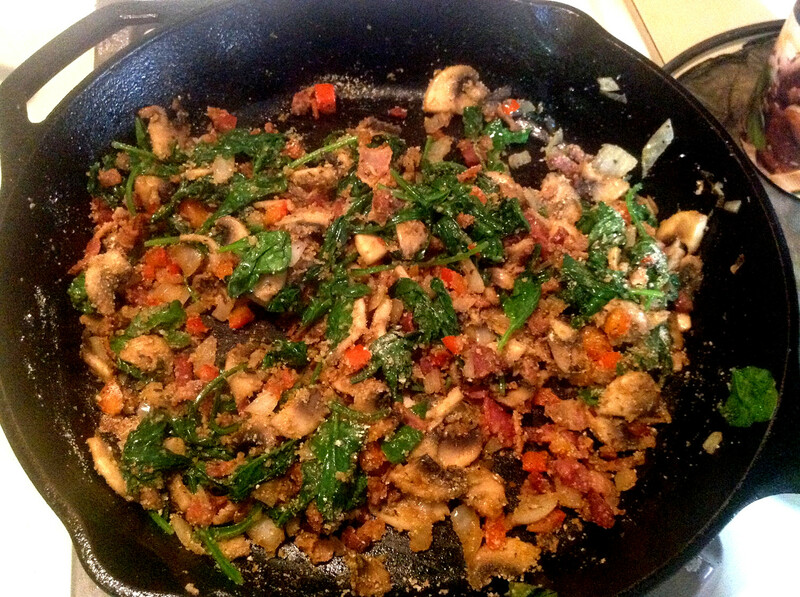 Add seasonings as you like---thyme, onion powder, garlic powder, salt, pepper… Stir in the toasted pinenuts. Lay out the turkey and put half the stuffing on each portion. Use kitchen string to tie it up as best you can. I never have enough time to be neat and usually just try to get it closed up enough so the stuffing doesn’t go everywhere. It always seems to come out looking appetizing no matter how messy my tying job is! Rub a little vegetable oil on and season the skin with whatever you like. I used Lawry’s seasoning salt, pepper, onion powder and a little thyme. Put the turkey on a rack in a sheet pan (or on a broiler pan) and put it in a 350 degree oven until the internal temp is about 165-170 degrees. It took about an hour. Remove from oven and let sit for 5-10 minutes. Cut and remove strings then slice and serve! I usually accompany this with a vegetable, mashed potatoes or noodles and/or some bread. If you have drippings in the sheet pan you can make a gravy. I used the turkey bones to make a broth and then just thickened and seasoned it to serve alongside. I cook it on a sheet pan and a rack but you could use a broiler pan with rack as well. Just spray them both with some cooking spray and put the turkey on the rack in the sheet pan. and then season the skin with whatever you like. I used Lawry’s salt, pepper, onion powder and a little thyme. Put it in a 350 degree oven until the internal temp is about 165-170 degrees. It took about an hour. Remove from oven and let sit for 5-10 minutes. Slice and serve! I usually accompany this with a vegetable, mashed potatoes and/or some bread. If you have drippings in the sheet pan you can make a gravy. I used the turkey bones to make a broth and then just thickened that to serve alongside. What Is An "Art Quilt"? Creating art out of fiber and stitch is my passion. In no other pursuit have I ever found the rewards and joy that I find in using textiles, thread, paint, beads, yarns, and whatever else inspires me to make an object of beauty to share with others. My work is based in the quilting tradition of three layers stitched together, but the artistry of it goes far beyond the basic piecing of geometric shapes to create a bedcovering. You will see reflections of nature in my work as I live in a valley in the Rocky Mountains of Western Montana surrounded by mountains, rivers, streams and my own garden. Color and texture inspire my work and they are my palette. I write about what I am doing with my art and where I hope to go. I create, I write, I teach, I share and I think about my art and tell you about it all on the pages of my blog. All Images Property of Heidi Zielinski. Simple theme. Powered by Blogger.